Annual Fall Social - Thank you to everyone who supported our September 19th big fall social! We welcomed over 90 guests to our Hall for the "Plethora of Pasta Dinner" (with all the trimmings) complete with delicious home baking desserts created by Christine Nichols. In keeping with a Fall Fair Theme the majority our door prizes this year were homemade donated items from the very talented residents of our area. The prizes ranged from crocheted afghans, slippers and hats to tasty jams & preserves and baking. The grand prize (two cords of split fire wood) was donated to the EVFA by Colin and Christine Allenby. All through-out the afternoon and into the evening we were entertained by the talented members of the Hi-Way 40 Blues Band. A special thank you to Debbie Blue (event coordinator) and all the cooks and helpers. We couldn't have done it without you! The EVFA provides both fire/medical response for the properties within the Erris Fire Protection District, 12k to 32k Princeton Summerland Road (Hwy 40). EVFA and Hayes Creek Fire/Rescue also have in place a Mutual Aid Agreement that allows one department to call upon the other for firefighting and water tender assistance. All our firefighters are 100% volunteer and practices are held every Friday 1:00 to 3:00 during the summer months and alternating Friday’s during the winter. As the EVFA is non-government funded, the $80.00 annual property registration fee goes towards the costs of operating the Fire Department. All properties within the EVFA Fire Protection District are welcome to register their property with the EVFA. Registration monies are due January. 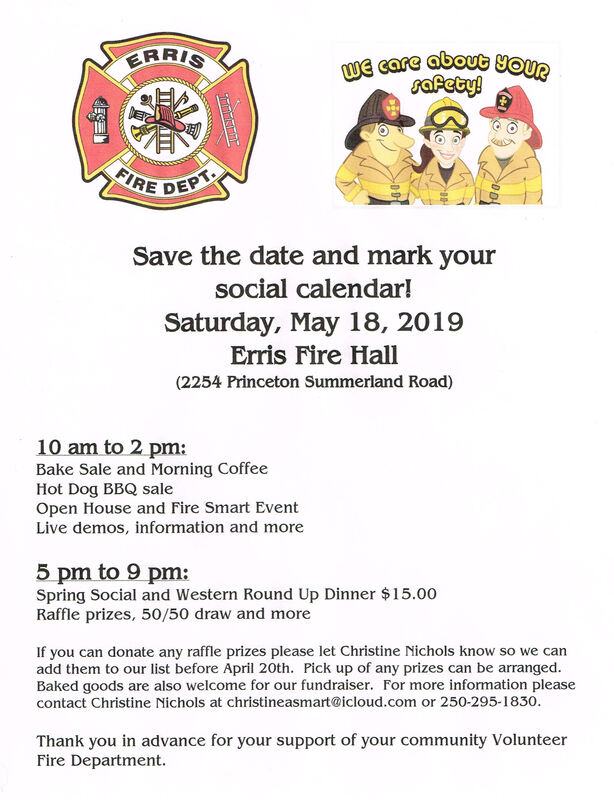 For more information, please email us at: firechief@evfa.ca, or call us at 250-295-3062.